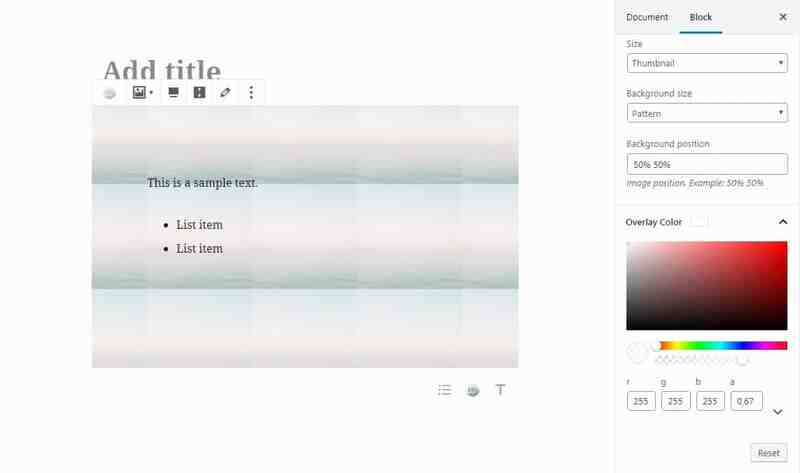 You can click on the Edit button on the toolbar to select a background image, but it’s also possible to set a background image on the sidebar. 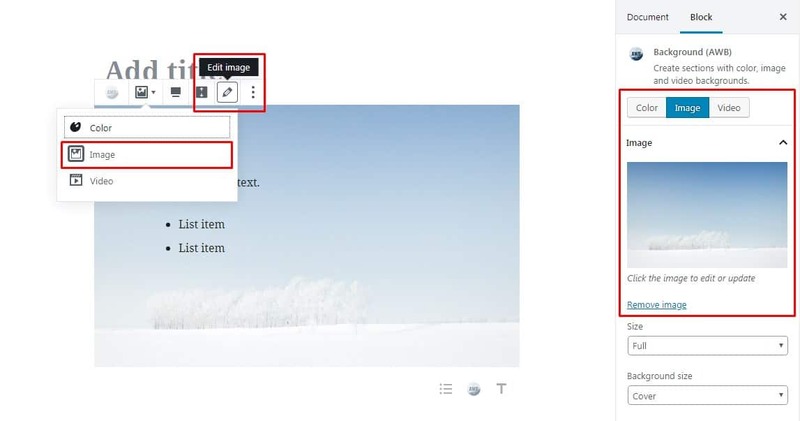 Edit your background image with the Edit button on the plugin toolbar or find the same option on the sidebar. Select an image from your media library or upload a new image. The Size, Background size, Background position, and Overlay Color options. Thumbnail (150×150) — An image will be shown cropped. Medium (300) — The size of an image will be reduced, and the largest side of your image will be of 300px. Large (1024) — the size of an image will be reduced, and the largest side of an image will be of 1024px. 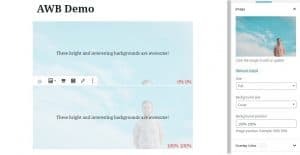 Full — Your image will be the same size as the original image you have uploaded. Cover — this option allows to preserve the original aspect ratio of an image, it is proportionally scaled, and the image height or width is the same as block height or width. Your image may look cropped. 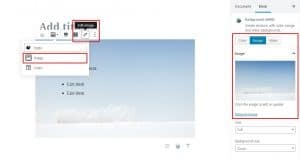 Contain — if you select this option, the image you use is scaled, and the whole image is shown inside the AWB block. Pattern — If your image is rather small, you can select this option, and your image will be shown tiled, repeated vertically and horizontally. 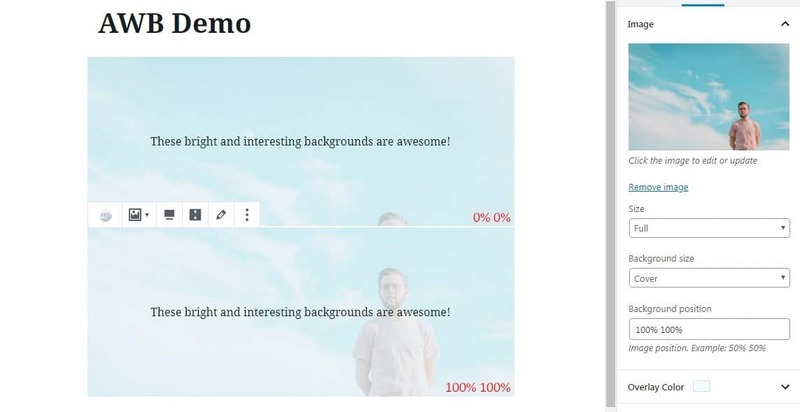 You can set the starting position of a background image. The first value is the horizontal position and the second value is the vertical position. The first image position value is 0% 0%, and the position of the second image is 100% 100%. The Background size type is Cover, that’s why the horizontal position changes are not seen. You can add an overlay color, for example, if your image is too saturated or detailed. Please note, that you also can adjust the transparency. Also, you can add the Parallax effects to your background images and videos. Please find the info about it here.